Due to the unfounded risk to come off as a homeboy fan or because of my original lack of awareness and discovering Arkona late, I have been remiss not contributing a single review for this up-and-coming Russian pagan/folk metal band. 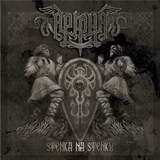 The last major release from Arkona came in 2009 in the form of the full-length Goi, Rode, Goi, so this Stenka na Stenku EP is a way to fill the gap and stoke expectations for the future Arkona release. And the Muscovites could not have picked a better selection of songs to showcase all aspects of Arkona and one more time establish the quality and authenticity of their metal style. Two openers Stenka na Stenku and Valenki are full-blown folk music infused energy shots. Accordion and all, Stenka na Stenku is Arkona’s answer to Korpiklaani and their “drinking songs”, only Arkona prefers their EP opener to be a rousing fighting song in the ancient tradition of Slavic youth where ceremonial fist-fighting was a part of festivities and initiation. Valenki, in fact, is a native Russian folk song, something I heard many a time on TV or radio growing up, and Arkona could not have come up with a more vigorous rendition. It is a well-known fact, that the Kremlin old men of the 70s Soviet Union liked Russian folk and preferred it to many other musical expressions. I wonder what they would think if they heard Masha “Scream” Arhipova inserting all of her voice power in Valenki accompanied by the incessant fast drumbeat. Also on the upbeat and energetic side of things there is balalaika led Skal done in cooperation with Freki of Varg. German/Norse lyrics, rough Viking vocals and a good deal of simple headbanging riffs – this song is going to be a staple on any future Arkona tour. Yet, at the same time, just as Arkona often showcased in the past, there is a whole lot of depth to their music, and they are absolutely not afraid to explore the more somber side of Slavic folk. The acoustic version of Goi, Rode, Goi is absolutely fantastic and tragic at the same time, marrying the deep meaningful lyrics, gliding melody and polyphonic vocals and folk instruments. Svarga’s cover Duren’ combines a quick move to blasting exposure and dreamy narrative dedicated to the wondering souls in this unforgiving world. Speaking of Korpiklaani, to close the EP Arkona goes way back in time to cover Odda Mailbmi, one of the band’s first ever songs when Korpiklaani was still Shaman. Crawling and creepy in the verse, the song has a buoyant pickup chorus, alternating between the darkness of enchanted forest and sunlight experienced when one finally manages to get out and experience the New World (Noviy Mir) which grew around that forest. Unlike so many East European (and Russian among them) bands who play folk infused music in the context of black metal, Arkona does the Slavic music with the addition of whatever metal style the song itself calls for. And that could be one of the reasons for the band’s growing popularity and their deserved appeal to a broader range of audiences.